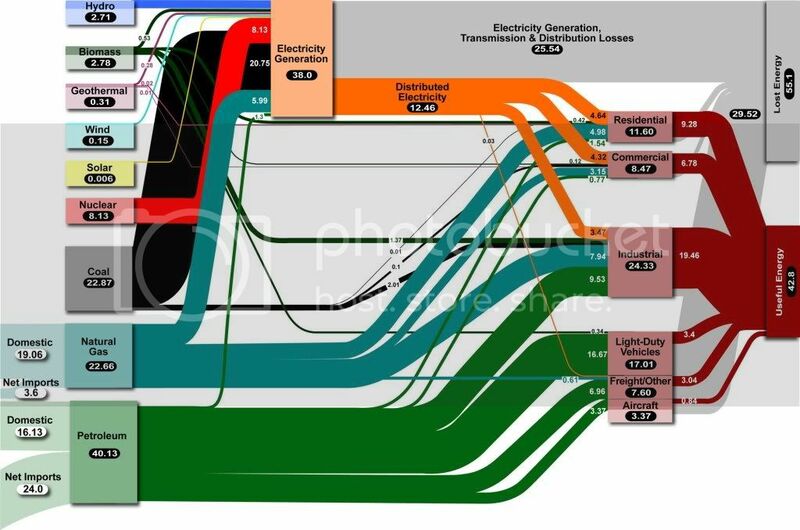 From Lawrence Livermore National Labs, old link an interesting graphic showing the flow of energy in the US (units are, I believe, 10^15 BTUs). US natural gas usage exceeds demand domestic supply; switching from oil to gas might improve efficiency some but isn't going to change our petroleum imports much. Electricity generation and distribution is nearly as inefficient as a passenger car and mostly coal-fired to boot. Plug-in hybrids don't help the big picture unless they're also part of some kind of distribution efficiency improvement. Freight is pretty efficient comparatively speaking. Dicking around with how we power semis is not going to help much. Doubling solar every 18 months (the current growth rate and not coincidentally equal to the doubling time in Moore's Law) won't even be noticeable for over a decade. It will take WWII-level increases in production for this to make a difference. Doubling wind could make a difference sooner than that, and even fractional differences in nuclear output would make a big difference. Geothermal makes a bigger difference than you'd think.